The Australian government is proposing that all cigarette packages be a dull olive color, contain graphic images of the harm caused by smoking, contain a written warning and only display the brand name in small text at the foot of the package. The intent is to strip away the marketing aspects of cigarette packaging that makes it appealing to people. Personally I think it's a great idea. 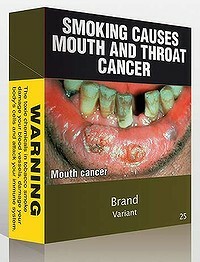 It is not as if the packages contain any false statements (smoking really does cause mouth and throat cancer). Of course this will not happen here, as we would never want to discourage people from smoking by forcing them to acknowledge the truth about their drug habit.